You don't need much in the way of tools to get started hairbraiding, but there are a few things that will make it easier. You may already have what you need around the house. It's useful to have a tail comb. Not all braiders use a comb, but using the tail of the comb is the easiest way to select a neat section of hair for the braid. Having a piece of card to keep the rest of the hair out of the way makes hairbraiding much easier. You can buy hair protector cards, or you can easily make your own. Find a clean piece of thin card and cut out a square about 12cm each side. Card from a cereal packet works well. 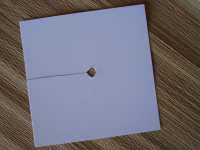 From the middle of one edge, cut a line right to the centre of the piece of card. Now cut a small hole at the centre of the card. It's easiest to cut a square or diamond shape rather than a circle. This central hole needs to be the right size for the hair you are going to braid to fit through. The easiest way to get the card to stay in place while you braid is to use sectioning clips. Many pharmacies (drug stores) sell small packets of these. 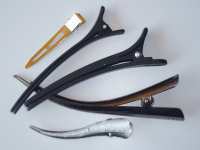 If you don't have sectioning clips, you may be able to manage with ordinary hair clips (kirby grips) or similar. 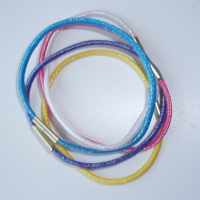 It's useful to have some kind of hair band such as a scrunchie or elastic band to tie the hair you aren't braiding out of the way. Good scissors are essential for hairbraiding, and you need a small, sharp pair which will cut threads easily. You don't need to get hairdresser's scissors, as you won't be cutting the hair, only the braiding threads. Not all scissors cut thread, and embroidery scissors are ideal. 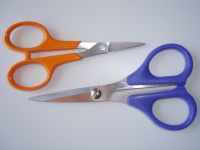 Be careful if the scissors you use have very sharp points as some embroidery scissors do. Some hair beads come with a plastic bead threader to help get the beads onto the hair. A bead threader is not essential. It's easy to make one with a short piece of jewelry wire or even a piece of thread.